Last Sunday, in the latest Downtown Abbey episode shown in the United States, Mrs. Patmore revealed that she had come into some money, with which she was going to buy a house in nearby small town or village (whose name, like Cervantes, I don’t want to remember, since it’s probably just as fictitious as Downton). And how much money was that? £300. Well, I wondered, what does that mean in today’s pounds? When a news story recounts a monetary transaction that took place in the past, there is usually a parenthetical note saying “x in today’s dollars”. But, according the website MeasuringWorth, there are quite a few ways of calculating the relative worth of money over the years, ranging from the Consumer Price Index (CPI) in the US and the Retail Price Index (RPI) in the UK — the most commonly used measure, often called the “real price” — to the GDP per capita index (called the “income value”), with several others in between. Of course standards of living have varied greatly over the years, and some things that may have been a luxury in the past are now within almost everybody’s reach. MeasuringWorth gives the example of the Ford Model T, which was introduced in 1909 at the price of $850 and would cost almost two years’ wages of a typical worker. By 1925, however, the price was $290, and car ownership was beginning to be the norm in the US. For this price, the 2012 values “range from $3,800 (the real price) to $19,000 (the income value).” Obviously, it’s the latter one that is much closer the price of a new entry-level car, even if the car bears little resemblance to the Model T. In 2015, a Ford Fiesta is advertised at around $15,000 to $16,000 but the actual price, with everything included, is around $18,000 to $19,000. Now the ratio of 18,500 to 290 is very nearly 64, and a 64-fold increase over 90 years is equivalent to a doubling every 15 years, since 2015 − 1925 = 90 = 6 × 15, and 64 = 26. For some time I have found the rule of a doubling every 15 years to be a handy guide to a realistic (not “real” in economists’ terms) measure of inflation. Going back to the time when I became an adult, about 60 years ago, I remember that a first-class postage stamp was 3 cents and a cup of coffee 10 to 15. Today first-class postage is $0.49 and a cup of brewed coffee (except in specialty cafés) ranges from $1.50 to $2.50. Now 60 = 4 × 15 and 24 = 16. Note that this factor works quite well for both coffee and postage. For the last three decades, the Big Mac Index has been a popular measure for synchronic purchasing-power comparison between currencies. But it can also be used diachronically within a given currency. The Big Mac was introduced by McDonald’s in 1967 in a few locations at $0.55, but by 1970 it was popular worldwide, and cost an average of $0.60 in the US. Today it is said to average $4.80 — a factor of 8. Now 2015 − 1970 = 45 = 3 × 15, and 23 = 8. Bingo! Doubling in 15 years corresponds to an annual inflation rate of about 4.73% (since 21/15 = 1.0473). But this rate also means that the value of money decreases by a factor of 10 over 50 years (since 1.047350 ≈ 10), and by a factor of 100 over 100 years. This last is a convenient, easy-to-remember result, and I like to call my formula the one-hundred rule. For other time periods the following results hold: 1.6 over 10 years; 2.5 over 20 years; 6.35 (6 can be used, since this is not an exact measure) over 40 years; and 40 over 80 years. The rule I have described applies, of course, only to the US dollar, which for at least the last century has been the global hallmark of monetary stability. In countries with fluctuating currencies prices for most commodities are usually set in dollars (even in countries nominally hostile to the US, such as Cuba and Iran) and converted to the local currency on a day-by-day basis. What about the pound sterling, then? The simplest way to deal with the problem of non-dollar currencies is to convert to dollars according to the rates of the comparison years. Until 1940 the pound held fairly steady at $4.86. Now it’s at $1.50. Since the episode takes place in 1924 or 1925, we have to multiply the 90-year inflation factor of 64 by 4.86/1.50 = 3.24, getting around 200 (there is no point in using anything but round numbers). This means that Mrs. Patmore’s £300 is now worth around £60,000. 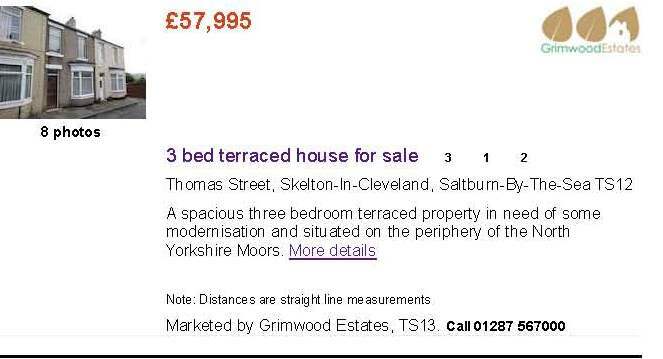 Is it possible to get a three-bedroom house in a North Yorkshire village for about that amount? Skelton-in-Cleveland is, according to Wikipedia, a small town rather than a village, but with a population of around 6,000 it’s close enough. I rest my case. You are currently browsing the Coby Lubliner's Blog blog archives for February, 2015.